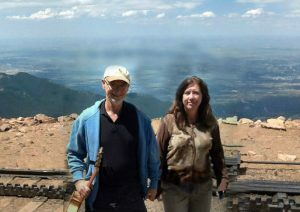 My wife Joni and I both love each other, our daughters, hiking in the Rockies. Joni, also a counselor, is an exceptionally amazing woman as all who know her would agree. After we married in 1990, she not only supported me in getting my doctorate but became a great mom for our two daughters. After beating breast cancer, she became the voice of breast cancer survivors for the American Cancer Society. She even spoke at the White House, where she shared a bathroom with the queen of Sweden and the speaking podium with Michelle Obama. After that, she earned her master’s degree and works with troubled Native American youth in Colorado. We had a dream early in our marriage to build a Christian counseling retreat center, and my hope is that we can fulfill that dream together in the the Rockies. We’re very proud of our two super-daughters: Riss, in her late teens, and Julianna is in her early twenties. Riss is recovering from Lyme Disease, and having two counselors as parents, and hopes to go to California Institute of the Arts and be an animator. Julianna has a bachelor of arts in psychology, works at Starbucks. Both of our daughters are very gifted, creative independent thinkers. My greatest regret in life is that my time with them went by so fast, and I let my work sap so much from me that I was not a better father for both of them! With that convicting song “Cat’s in the Cradle” in my head, my hope is that God grants me the grace to spend far more time with each of them in their adult years. I try to “abide in Christ” on a continuous moment-by-moment basis, in secret, conversational prayer. A minute not spent in God’s presence, for me, is a minute wasted. Next, I seek spiritual and emotional intimacy with Joni more than with anyone else, and our daughters and clients benefit from the overflow of our love for each other. I also try to have as much meaningful time with each of my daughters as I can each week, and have a few Christian brothers with whom I have “Jonathan-David” relationships for over twenty years, meeting at least once a month for support and accountability. I also worship at Forest Hills Evangelical Free Church in Loves Park, IL, where I have the privilege at times to lead worship, and offer teaching and pulpit fill to other churches at times. I try to spend time with God in the Word every morning and spend at least an hour or two daily playing, writing, and arranging music on guitar. In addition to hymns, I’m a big fan of classical music, Americana/Gospel, classic rock. I have a YouTube music channel where I enjoy sharing videos of my finger-style interpretations and solo guitar arrangements.